Well, that was one world-wind trip to Florida. And it made us miss Florida even more! It was sunny and 80 degrees, palm trees swaying in the nice breeze. It confirmed our intentions of one day relocating to Florida on a more permanent status. Our trip started very early morning, 3 am to be exact on Sunday morning. Why so early? 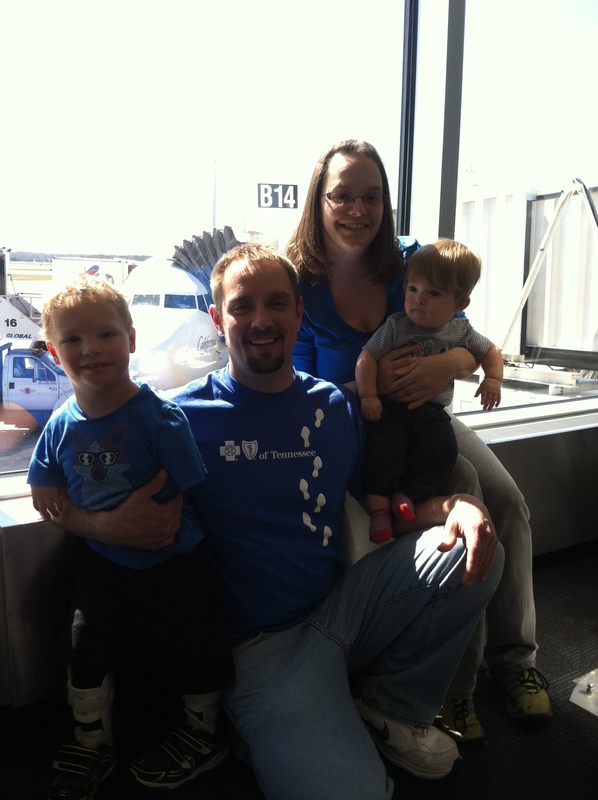 Because Miracle Flights partners with Southwest Airlines to provide paid travel for families who must travel long distance for medical needs and unfortunately Evansville is not one of Southwest’s hubs. So, we made probably our earliest trip to Nashville we’ve ever completed. We collected our many items, hopped on a shuttle, cleared security and boarded our first flight with minimal interruptions. 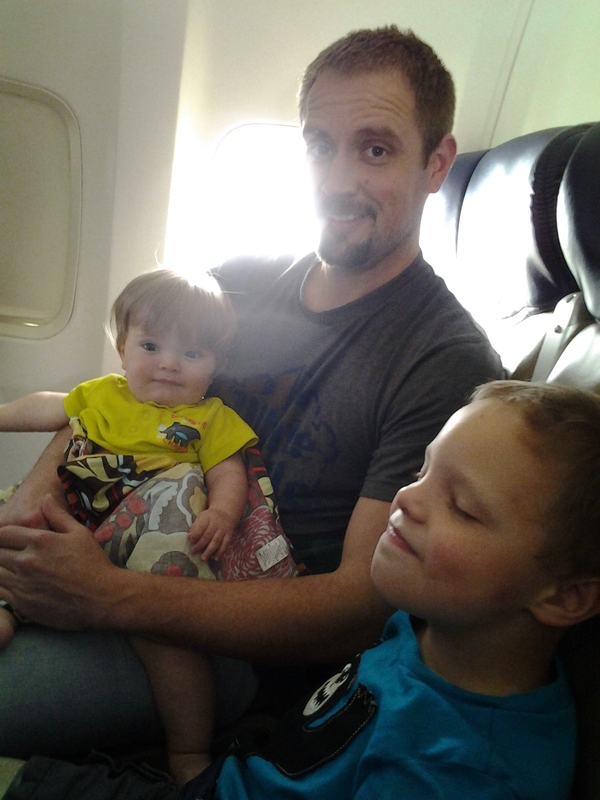 Both boys enjoyed the flights and despite other surrounding passengers’ expectations of the clichéd plane ride with small screaming and kicking kids, both Drew and Holden created no disturbance. We connected in Baltimore and like a cruel joke we were joined on the plane by a very large group of high school students who were probably on their way to Southern Florida for Spring Break antics (bastards!) and made it to West Palm Beach by mid-afternoon. We picked up our rental car (my always go-to rental when available, Nissan Cube). We had reserved a guest suite at the apartment complex in which we previously stayed during our original stay in WPB so we quickly settled in before rushing off to the community swimming pool. After a good swim, we dried off, got dressed and rushed off to one of our favorite West Palm Beach locales: downtown where we watched Captain America: The Winter Soldier in our favorite theater and ate some dinner. Make a good friend whenever you go to Paley’s for a visit! When Dr. Paley and his team were finally ready to see us, they all crowded the hallway and watched Drew walk for the first time. He didn’t use a walker or anything. Just strolled up and down the hallway, much to everyone’s delight. 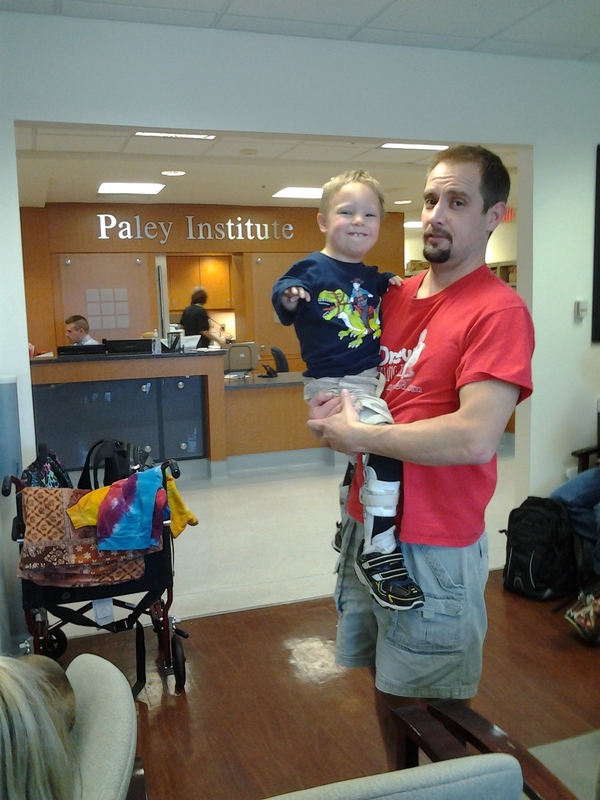 Most of the kids that Paley sees already walk prior to surgery, albeit with special shoes or an assistive device. Rarely have I seen one with so little ability as past Drew. So to see him go from completely disabled to walking independently was very rewarding for them, I’m sure. They were all pleased with Drew’s progress. Dr. Paley and his team examined Drew’s newest set of x-rays and there were the typical whispers of a summarization of TAR Syndrome and Drew’s surgical past with some new members of the team studying under Paley. I overheard the term, “stress fracture” and they were comparing today’s x-ray with a previous x-ray. 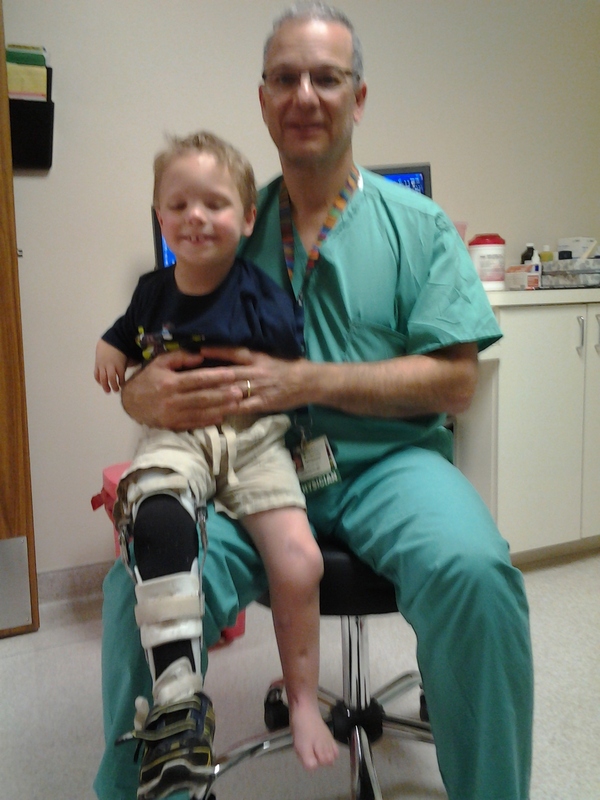 Dr. Paley finally turned to us and explained that at some point Drew’s left leg, just above the ankle, had experienced a fracture. It has already healed, but it was likely the reason that Drew’s left foot was rotating internally 20 degrees. This news was a shock to us. We have no recollection of any event that could have caused a fracture. Was it during therapy? Was he playing too rough? Did he injure himself while walking/falling? Who knows. But, I feel like a jerk for all of this time Drew had a broken leg and I didn’t know it. He had been complaining of frequent pain for a while so it seemed like some type of explanation for those sleepless nights, but I never entertained a thought that he had been seriously injured at some point. 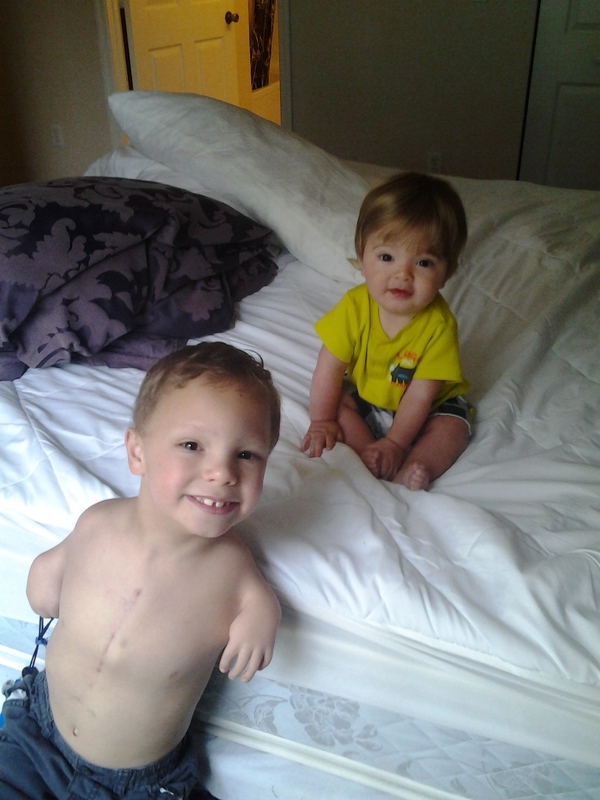 The toll these surgeries have taken on Drew continue to surpass our expectations. It is clear that we had no idea what we were getting into when planning for these surgeries: two unintentionally broken bones, infections, a stressed heart, tears, pain, labor, therapy, braces, a mentally changed Drew. 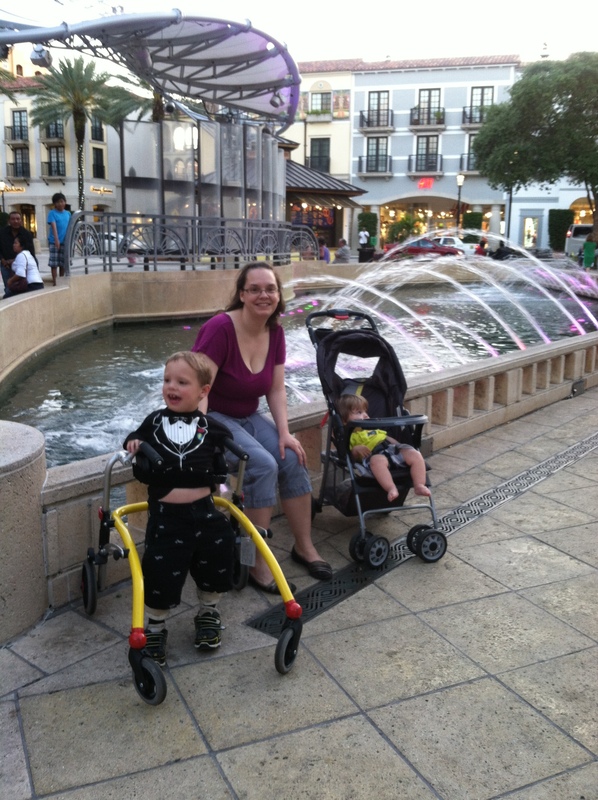 But, now that he’s walking independently it was all worth it and I’d do it again. Dr. Paley explained that the rotation would have to be corrected and I’m sure he saw the fear in our eyes, imagining another round of an external fixator, so he quickly added it would just involve a plate and screws placed internally during a surgery. And, even more fortunately, he can do it at the same time as removing the rod from his left femur (during the removal of his left fixator, a metal rod was inserted into his femur to prevent a fracture like that of the fracture he endured during therapy on his right femur.) And, there is no rush to do the surgery so we can wait another year unless it causes any problems. We discussed his goals and physical therapy and Dr. Paley is going to see us again in October. All in all, it was an enlightening visit. As I went to the front desk to schedule our next follow-up visit, Nathan hung back in the room to collect our belongings then quickly stepped into the private bathroom that accompanied the exam room. After collecting my appointment card, I spied Daddy walking up front sans Drew. With a raised eyebrow, I asked if he had perhaps forgotten something but he gave me a look that suddenly made it obvious that Drew was playing his usual game of hide and seek and Daddy thinks that I’m playing the ignorant card to help cover Drew. Only thing was, I honestly didn’t know where Drew was. I had not made secret plans with Drew to conceal his hiding place. After some convincing, Nathan finally decided to believe my pleas of ignorance and we both nervously looked for Drew. It’s never occurred that neither one of us knew of Drew’s whereabouts. After several minutes of checking and rechecking all possible hiding spots, a lady finally approached us and said he was down the hall. I was stunned as he would have had to have walked right past me to get to his current hiding spot. I couldn’t fathom how he could have snuck past me unseen or even unheard (his braces make a very recognizable click!-clack! when walking.) Sure enough, there he was. The little ninja got past me. 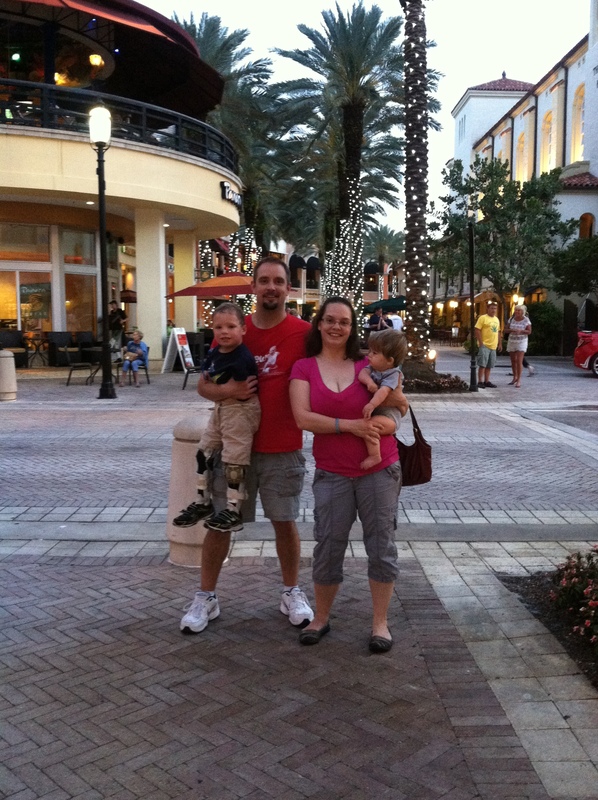 We took advantage of our last night in WPB by going downtown once more to enjoy a good dinner. We got back to the apartment, angrily watched the ‘cats vs. UConn game (Calipari: get those men in front of a goal and make them practice those foul shots until their arms hurt), and went to bed to prepare for another long day of air travel. On a final note, thank you to Miracle Flights for taking care of our air travel and thank you to Random Acts for your added support to help us make this trip happen! I couldn’t resist a picture recreation. The difference 9 months make! We have a lot of baggage. We didn’t have to get up as early as our arrival flight thankfully, but we did get an early start in the morning. We made it through the airport quickly and onto a plane. 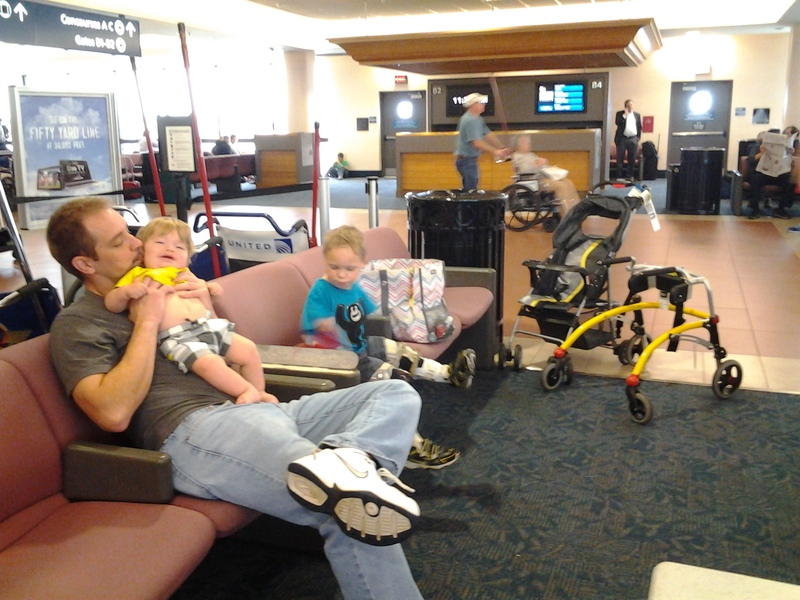 Before the plane pushed away from the gate, as I held Holden in my lap, I felt the familiar vibration from his diaper followed by a very worrisome sensation of warmness. Knowing Holden’s propensity for his excrement to breech his diaper, I nervously took a peek in my lap and was shocked to see the puddle of very loose stool puddling in my lap leaving a green stain on my light grey jeans in a very awkward place. Nathan quickly grabbed as many wipes as he could, suddenly seeing that we only had four remaining wipes, and I scooped gobs from my lap. Our only carry-on was the boys’ diaper bag and contained nothing for me so I had to remain soiled in baby sh#@, reeking of poo, for the remainder of our trip. Then, once again, Holden’s diaper was breeched causing a new stain and embellishing the aroma and it was only then that we realized that we were out of diapers and only had one Lil’ Swimmer left. 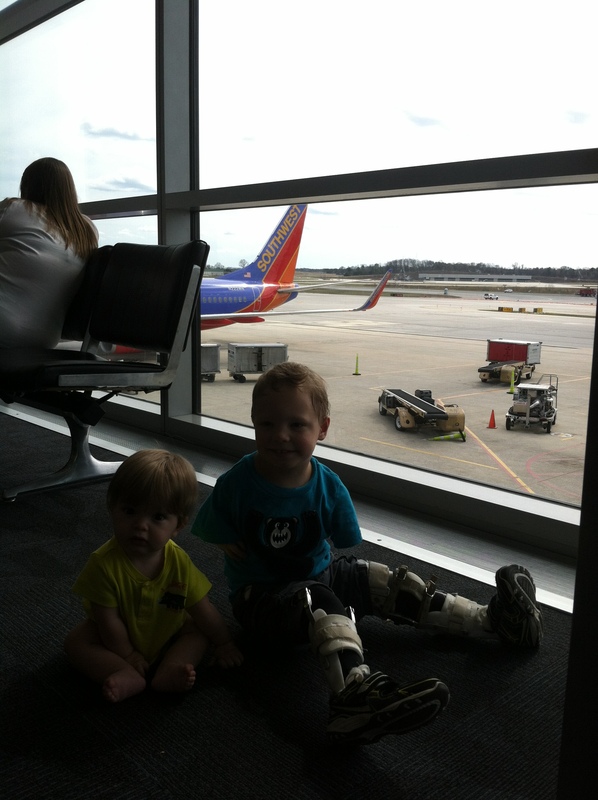 By the time we arrived in Nashville, Holden was pantsless, wearing a Lil’ Swimmer and a short shirt. And my pants were green splotched. If we weren’t exhausted enough from six hours of airplane travel, we were now gearing up for a three-hour drive home. We made it though and all in all, it was a good trip.